Apply now to reserve your place in Armagh, Northern Ireland. PROGRAM COST: $4,995 + airfare (Includes: Tuition – 3 transfer credits through the University of Jamestown, accommodation, class instruction, cultural activities, farewell dinner, travel insurance). 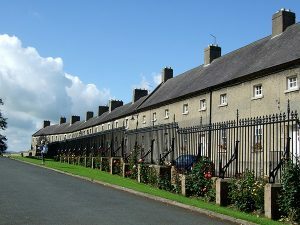 GENERAL LOCATION: Armagh, Northern Ireland, U.K.
FOCUS: Playwriting and theatre performance in the U.K. or public opinion writing on on issues facing Northern Ireland, Ireland and Europe. The Armagh Project offers two tracks for students to choose from: public opinion writing and performance/playwriting. Students learn and practice skills in their chosen field while sharing with each other through travel, readings, class activities and guest speakers. 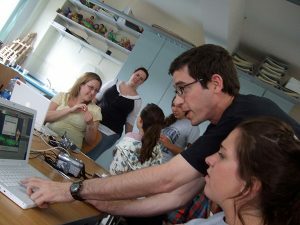 Students live at the modern Armagh City Youth Hostel and have classes at the AmmA Centre, a technologically enhanced multimedia center in the heart of the historic city. Students will also spend a week at Glebe House in County Down and visit Belfast and the surrounding community. Students present their work at the John Hewitt International Summer School, an international festival of writing and performance at the Marketplace Theatre in Armagh. There is an optional trip to Dublin at the start of the program. 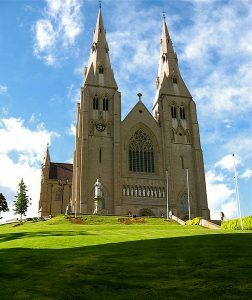 Armagh is situated 40 miles south of Belfast and 80 miles north of Dublin, placing it firmly as a cultural and political fulcrum in the long history of Ireland. The people of the town can share stories about “The Troubles” – the time of conflict between British rule and the quest for Irish autonomy – but are just as quick to point out the signs of a thriving city nurtured under the shelter of decades of peace in the region. Armagh offers a healthy shopping district, diverse dining options, a state-of-the art multimedia center and a modern performance and art space as contemporary counterpoints to the more ancient cultural and historical sites within and without its walls. Check out the work of our students in our 2015 program blog at armaghproject2015.wordpress.com/reporting. Check out the site students produced in the 2014 program at armaghproject2014.wordpress.com. Students in this section will choose ‘beats’ to cover during their time in Armagh. Students will research and report on topics and will post daily blog entries as well as weekly opinion columns. Those interested in taking photos and shooting video will be able to do so as we try and illustrate opinion in several different formats. The hope is to partner with a news organization where students will have their work published. Read and explore texts from Irish playwrights while creating and presenting your own work. 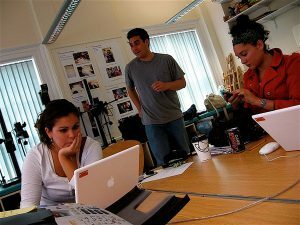 Learn professional techniques for making devised work, including improvisation, story arcs, character study and freewriting. Structured peer and instructor feedback sessions propel your work forward. Classroom instruction in dramatic structure, writing practice, acting and vocal training help students explore the creation of theatre from idea through writing and into performance. This program is appropriate for both experienced student playwrights and actors as well as those considering their first theatre experience. Undergraduate Credit is included in the program fee and is provided for all students through the University of Jamestown. Students will need to complete the appropriate paperwork from the University of Jamestown prior to departure in order to receive credit. After acceptance to the Armagh Project, program staff will contact you to assist with registration. This class is appropriate for three undergraduate credits. Graduate students are encouraged to work with Armagh Program faculty to develop an individualized course of study that will meet curricular requirements for the student’s home school. Graduate students have the option of bringing a work-in-progress or thesis research focus to the Armagh Program in order to continue building in the student’s area of academic focus. This course is appropriate for four graduate credits. The writing programs at ieiMedia are taught by master teachers and writers who bring their professional expertise as guides to emerging writers. Professional and post-graduate learners benefit from moderated small-group experiences and one-on-one coaching that allows for individualized plans of study or work. The Armagh Program is an ideal place to begin work on a new creative endeavor and a robust writing environment for developing work in progress. Armagh is rich with study and research opportunities to support any creative endeavor. The Armagh Public Library was founded in 1771 and holds among its collection of medieval and 17th century manuscripts, engravings and Irish artifacts, a first edition of Jonathan Swift’s “Gulliver’s Travels” (with Swift’s notes) and a copy of Gwynn’s “Book of Armagh.” The Cardinal O’Fiach Memorial Library and Archive houses material related to Irish history and language as well as church history, history of the Irish diaspora and Irish sporting traditions. The Irish and Local Studies Library, the Armagh City Library and the AmmA Center round out the scholars’ resources. Frequent and ample bus service will take you to Belfast in just over an hour and to Dublin in just over two hours – opening access to more of Ireland or to other areas of Great Britain or Europe through the international airports of both cities. The Armagh Program includes free time for students to travel on their own as well as trips to Belfast with the group. The Armagh Program in total is open to up to 25 undergraduate, graduate or post-graduate/professional students across both programs. Over the past decade, participants in ieiMedia programs have included more than 800 students from 80 U.S. and Canadian campuses, along with students from Japan, Peru, Singapore, Thailand, Trinidad, Turkey and the United Kingdom. This course is particularly suited to those students interested in public opinion writing, creative writing, playwriting, theatre studies, Irish cultural studies, literature, poetry and storytelling. Enrollment is open to students from any major, provided they have a strong writing or performance background. Terri Ciofalo (Program Director) is a professional theatre artist and experienced production manager who teaches graduate and undergraduate theatre at the University of Illinois Urbana-Champaign. She earned her MFA from the Yale School of Drama and has toured theatrically both in the United States and overseas. Steve Fox (Opinion Writing) is a senior lecturer at the University of Massachusetts Amherst. Steve has been a professional journalist for more than 30 years, including 10 at The Washington Post’s website, and has taught at UMass for the past 11 years. He revived the department’s Opinion Writing class over the past several years and writes regular columns for several journalistic outlets, including the Daily Hampshire Gazette and The Poynter Institute. View complete faculty biographies on our Armagh Faculty Page. Students and faculty will be housed at the Armagh City International Youth Hostel. Kitchen facilities and some communal meals are provided. All students should bring a laptop equipped with Microsoft Word and a thumb drive for transferring work. Each student should also bring a digital camera or other device capable of taking quality, downloadable photos. Other equipment might be outlined in the course syllabus. The cost is $4,995 plus airfare. Includes: Tuition – 3 credits, housing, instruction, travel insurance, farewell dinner and cultural activities. Apply now to reserve your place in the Armagh program. Or, contact Program Director Terri Ciofalo at: terri.ciofalo@ieimedia.com. Students must fill out the online application and include contact information for two references using the “Apply Now” link. A $100 application fee is required with the application but will be applied in full to your program fees or refunded if you are not accepted into the program. Application deadline: March 1, 2019.